Beyond just species: Is Africa the most taxonomically diverse bird continent? We analysed avian diversity in 8 similar-sized regions of Africa, and in an additional 16 regions spread across the world; half of these 24 regions were tropical and the other half were temperate. For each region, counts of species, genus, family and order were recorded rather than only a species count. We assert that this approach gives more accurate insights into diversity patterns, as we show that in relatively species-rich parts of the world species are on average taxonomically more similar to each other than in species-poor areas. Northwestern South America is the world's most species-rich region for birds, but we show that sub-Saharan Africa has greater diversity at higher taxonomic levels and is thus arguably the richest corner of the world for birds: the Mozambique-Zimbabwe region displays the highest diversity at the order level (with 30 orders), with all other sub-Saharan regions having between 27 and 29 orders each. Northern India is also extremely diverse (surprisingly so for a marginally temperate region) at all taxonomic levels below that of order. We hope that our study might generate further analyses of avian diversity beyond the species level. Using species as a measure of diversity, without counting higher taxonomic levels such as genera and families, can be misleading. Species can be seen as outer branches of a phylogenetic tree, and instead of just counting these, a more accurate measure of diversity can be obtained by taking systematics into account. Over the past 20 years, indices of diversity have been derived which rely on the information content of phylogenetic classification, providing a measure of taxonomic distinctness,1 in particular 'phylogenetic diversity'.2,3 While these indices are useful provided that the requisite phylogenies are available, in their absence the most practical way of obtaining a broader view of diversity may be simply to count not only species, but genera, families and orders. In the case of birds, a wealth of distributional data has been collected by amateurs, some of which has been formalised in atlas projects. These data can be used particularly in optimising choices of which areas to prioritise for conservation,4 but we believe it is important to look beyond species to other taxonomic levels. In bird studies, authors rarely consider other taxonomic levels, despite the fact that the non-avian literature highlights the need to do so.4,5 Similarly when considering endemic bird areas, endemic genera, families and orders should also be (but usually are not) included in assessments. 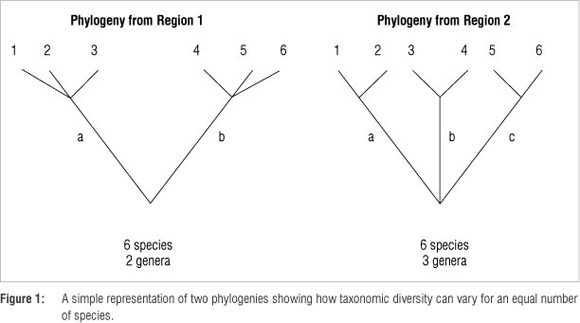 Considering Figure 1, the simplified phylogenies from two hypothetical regions both generate species counts of six. Region 2, however, obviously has a more diverse birdlife, because its six species are distributed across three genera compared to two genera for Region 1. 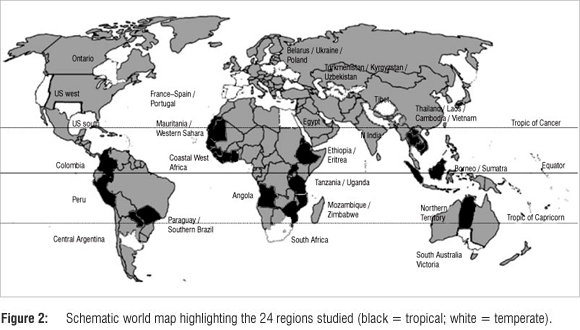 This distribution effectively means that the species of Region 2 are on average genetically more different from each other than those of Region 1, giving a greater 'genetic diversity' in Region 2 despite identical species counts between the two regions. Here we have undertaken a preliminary analysis of patterns of bird diversity in Africa by counting all taxonomic levels from species upwards from eight similar-sized areas of the continent. Using the same method, we also compared avian diversity in 16 of the most species-diverse areas of similar size on five other continents. We downloaded bird lists from Avibase8 for regions of similar size, using the taxonomy of the International Ornithological Congress (IOC 2011)9 throughout to control for differences in taxonomy. We counted the number of species, genera, families and orders for each region, removing accidental (vagrant) and introduced (feral or alien) species. By combining lists for smaller countries (e.g. Tanzania and Uganda) we were able to obtain contiguous areas of approximately the same size as medium-sized countries such as South Africa or Colombia, and about the same surface areas as parts of larger countries such as the USA, India or Australia (Figure 2). All of these areas have a coastline and therefore contain the widespread coastal bird families. The smallest region in our analysis is Egypt, which is 74% of the size of the largest region (Northern Territory, Australia). Table 1 shows the area of each region relative to that of Northern Territory (Australia), along with all our other data, sorted by decreasing family diversity. We used simple regression analyses (Microsoft Excel) to test for relationships between genus count, family count, order count, species:genus ratio, species:family ratio and species:order ratio, all as functions of species count. We did the same for higher taxonomic levels as a function of genus count. Analyses were undertaken separately for tropical and temperate regions. Colombia and Peru displayed the highest species diversity, with 1816 and 1752 species, respectively (Table 1). Figure 3a shows that there is- a strong relationship between genus and species counts in tropical (r2 = 0.894, F = 84.346, p < 0.001) and temperate (r2 = 0.847, F = 55.238, p < 0.001) regions. Interestingly, family diversity is not related to species diversity in tropical regions (r2 = 0.002, F = 0.016, p = 0.902) but is in temperate regions (r2 = 0.719, F = 25.643, p < 0.001) (Figure 3b). Family diversity is remarkably low in both Colombia and Peru, with only 86 and 87 families, respectively. 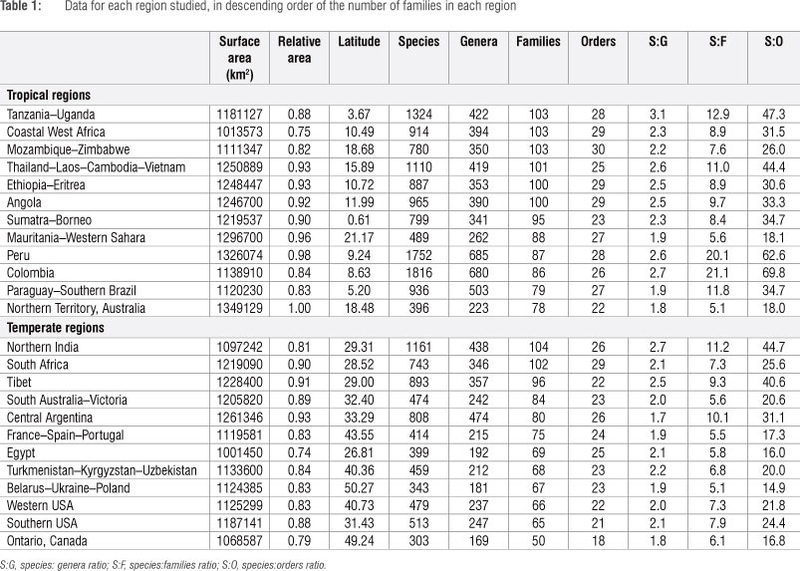 Family diversity is exceptionally high in Northern India (104 families) and sub-Saharan Africa (103 families in three regions and 97-101 in all the other sub-Saharan African regions; Table 1). Again, family count plotted as a function of genus count is not significant in tropical regions (r2 = 0.030, F = 0.311, p = 0.589), but is in temperate regions (r2 = 0.562, F = 12.821, p = 0.005) (Figure 3c). There is no relationship between species and order counts in tropical (r2 = 0.053, F = 0.555, p = 0.473) or temperate (r2 = 0.267, F = 3.647, p = 0.085) regions. Nor is there a relationship between family and order counts in tropical regions (r2 = 0.289, F = 4.061, p = 0.072), but there is in temperate regions (r2 = 0.527, F = 11.162, p = 0.007). It is noteworthy that the top five order counts pertain to the sub-Saharan African regions: 29 each for Coastal West Africa, South Africa, Ethiopia-Eritrea and Angola, and 30 for Mozambique-Zimbabwe, the highest on the planet. No other continent contains regions with more than 28 orders (Table 1). The more species a region has, the more speciose its families are, in both tropical (r2 = 0.955, F = 214.389, p < 0.001) and temperate (r2 = 0.844, F = 53.999, p < 0.001) regions (Figure 3d). Similarly, the more species a region has, the more speciose its genera are in both tropical (r2 = 0.500, F = 9.988, p = 0.010) and temperate (r2 = 0.491, F = 9.659, p = 0.011) regions. Increasing family and genus sizes as species count increases imply that species become more genetically similar to each other as species diversity increases. Removing the exclusively pelagic order - Procellariiformes (comprising four pelagic families) - changes none of the trends or statistical significances reported above. The high and deep-rooted (family and order level) avian diversity in sub-Saharan Africa can be attributed to the Gondwanan origin of a large clade of mainly terrestrial birds which includes the songbirds, Coraciforms, Piciforms, owls, diurnal raptors, trogons, mousebirds, cuckoo-rollers, seriemas, parrots and New World vultures. Three reciprocally monophyletic groups within this clade diversified in Australia, South America and Africa during the Late Cretaceous to early Palaeogene. But although each continent may have originally included other groups, the songbirds and parrots remain the only survivors of the Australian radiation and the falcons and seriemas of the South American radiation. All remaining taxa within the clade are included in the taxonomically diverse group of survivors of the African radiation. In Australia, South America and Africa, different groups have radiated separately in response to local conditions, but the African continent contains by far the largest surviving group of survivors of the Gondwanaland avifauna.10 This history, together with the great diversity of habitats in sub-Saharan Africa, has led to this region having the world's highest levels of avian diversity. When prioritising which areas to conserve, it also seems imperative that higher taxonomic levels need to be considered, but these are often ignored in work on birds. Once the species of an area are known, it is a trivial exercise to obtain counts of higher taxonomic levels from the species list; two previous studies have indicated the potential importance of this approach. Phylogenetic diversity2 and genus diversity in birds were measured5 using atlas data11 in three provinces of South Africa: Northern Province, Gauteng and Mpumalanga. The minimum number of sites which represent all genera or the maximum phylogenetic diversity of birds was then optimised, and these two measures were equally effective in selecting complementary sets of potential sites for conservation. Changes in breeding birds in New York State over a 20-year period were studied4 using atlas data12,13; changes in both genus and family richness between 1985 and 2005 correlated strongly with changes in species richness and displayed similar spatial patterns, with genus richness being the more reliable predictor of the two. In terms of determining priorities for conservation, considering taxonomic representation above the species level is probably even more crucial in Africa, where resources for this purpose are usually more limited than in the developed world. For example, consider two Important Bird Areas (IBAs) each with eight Endemic Bird Area (EBA) species. The eight species in Malawi's Nyika National Park IBA (within the Tanzania-Malawi Mountains EBA)- are distributed in seven genera, all of which are very widespread African genera. The eight species in Madagascar's Mikea Forest (threatened yet currently unprotected), should be an even higher conservation priority, as they are in eight genera, one of which is found in no other IBA, and three of which are confined to the South Malagasy spiny forests EBA.14 Patterns of endemism, and endemic bird areas in particular, urgently need analysis beyond the species level, as by considering higher taxonomic levels the patterns of diversity (and endemism) revealed can change substantially. We recommend counting at all taxonomic levels in existing IBAs and EBAs as a first step in assessing how priorities might be affected. M.I.C. thanks the National Research Foundation for financial support, and the late Phil Hockey for hosting his sabbatical at the Fitzpatrick Institute, where this paper was written. Comments from three anonymous reviewers significantly improved the manuscript. C.N.L. conceived the idea and wrote the first draft; J.A.C. and M.F. sourced and analysed data; and M.I.C. revised and wrote subsequent versions of the manuscript.